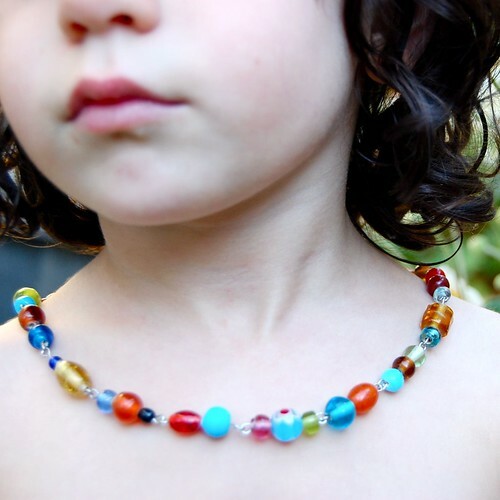 I have a favorite necklace that kind of looks like this one except it's very, very long and the glass beads are smaller. I bought it for a dollar in Manikaran, India, a small town in the Parvati Valley (far north), well known for it's geothermal activity and a sacred spot for the Sikh population. We were there in 2001 and my clearest memory is going to the public bathhouse where I stood out like, well, a naked white girl in an Indian bathhouse. So when I left the bathhouse I went to the marketplace and found a few things to help me fit in better - about thirty glass bangles and the necklace. It might have worked if I could have stacked the glass bangles all the way up my arms, around my neck and up both legs, so that no one could see my casper white skin. Alas, I still received many stares. And I sounded like a wind chime. Lately I have been in a creative rut, feeling a little strangled by my watercolors. So today, I went to the bead store two blocks from my house with my India necklace and my pile of Santa Fe glass beads and high hopes that a little wire and bead work might kickstart my creativity. The guy at the store sold me a round nose pliers, a bunch of eye wires and a clasp and sent me home to look at You Tube for instructions. Which is what I did. And here is my necklace which, on me, is more of a choker, ironically, but in the bigger picture, might just be what I needed to open up the flood gates.